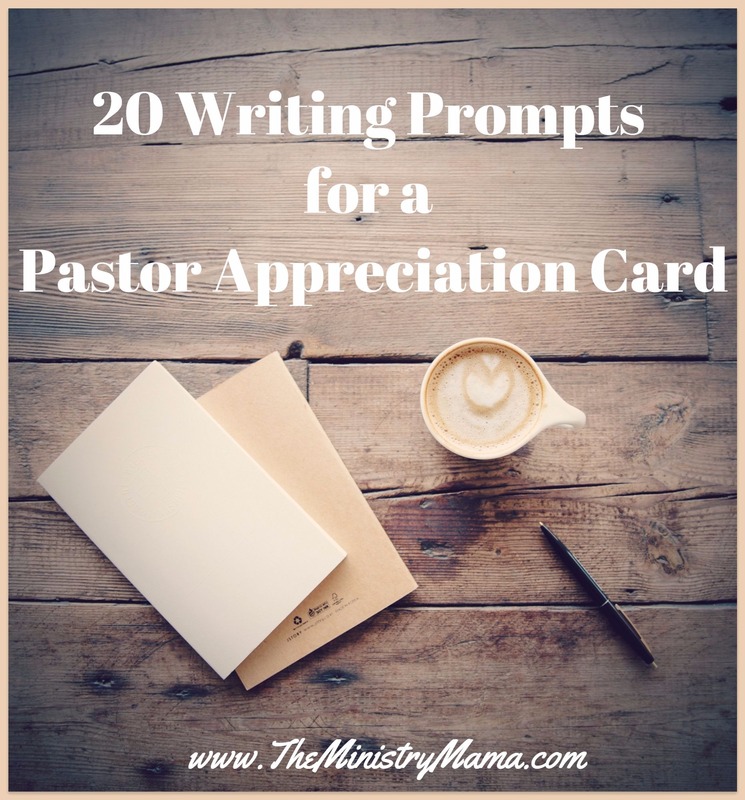 October is the month when so many church members and church staff search for ideas to be able to shower their pastor and his family with love during Pastor Appreciation Month. As a writer, I would encourage you to put a good letter or a very nice message in a card. Write down your heart’s feelings, take that time to really put them on paper and share them with your pastor’s family. People will use a gift and may eventually give it away but many ministry families will keep cards in a file or a box to read in times of discouragement or reflection. Not every pastor is discouraged or going through a trial but eventually they will. A well written card or letter can be meat to a hurting pastor’s heart, they can revive a tired mind, and help a man on a mountaintop continue to press forward. Never underestimate the power of your written words to help God’s servant keep serving faithfully. What you say may be exactly what the Holy Spirit will use to speak to their heart on any number of matters. Some people are intimidated by writing meaningful messages in a card or taking on the challenge of writing a full-blown letter. It doesn’t have to be hard. Be yourself when you write and ask God to guide your hand and your heart. He will help you fashion a meaningful (to both you and the pastor) note that can be an encouragement. Simply give thanks to him and his family for their leadership and work in the church. Give details on how he has influenced you or helped you spiritually. Write about the usefulness of his messages and their specific effect on your life. Explain how the Holy Spirit used something he said to change your life. Write about your perspective of his testimony and how it blesses you. Elaborate on specific character qualities that make him a unique man of God. Write about an event that sticks out in your memory where his wisdom helped alter a specific trial in your life or the ministry of the church. Recognize his time and investment into the church and its members. Highlight the fruitfulness of his ministry and how through the years the ministry has changed for the glory of God. Describe the power of God through his preaching. Give an example of how his marriage and/or parenting skills have been a particular blessing to you. Explain how souls have been saved during the years he has led the ministry of the church and its impact on eternity. Acknowledge his struggles and trials and encourage him to continue to serve and live faithfully. Impart a message of blessing, similar to the blessings in the Old Testament given by Abraham, Isaac, and Jacob. Disclose your thoughts of how he and his family are a good example to the church and the community. Make a list of prayers that have been answered in the last year and show him how God has worked in the lives of the members of the church. Compliment his family for loving other people, serving, and teaching others truths of the Bible. Tell him that you pray for him regularly. Explain what his friendship means to you and your family. Compliment his dedication to Bible doctrine and his faithful study of God’s Word. This is an article that can help you all year round to be a blessing when you notice your pastor and his family need it. Please never discount the effect you can have one someone’s ministry just by taking time to express your thoughts in honest gratitude and genuine care. Happy Pastor Appreciation Month y’all!